To help augment the posts that rely on fermentation (much slowed by the chilly temperatures in my apartment), I’ve started some cordials and infusions to see me through the winter and into spring, and the first to be ready is this elderberry cordial. I think I probably first stumbled onto the concept of cordials in the Redwall series, by Brian Jacques. In his case, the cordials are the generally non-alcoholic (albeit naturally fermented) sort. I plan to try out a few of those recipes as well, since traditional British fare fits very well into the world of Westeros, too. But first, the elderberries. The immediate perk of this cordial is that it is ready to drink as soon as the berries are strained out. The color seeps from the berries almost immediately, and gradually darkens to a striking near-black purple. The flavor is incomparable for so young a cordial. 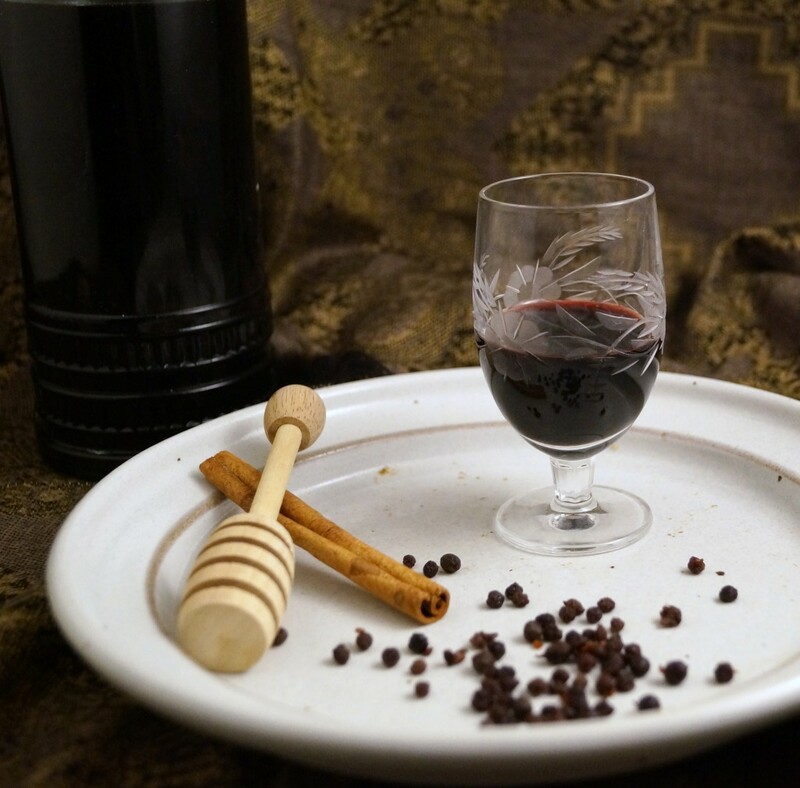 Thick with honey and maple sweetness, a whisper of cinnamon, and the full fruity impact of the elderberries. This one’s going in the pantry for every future winter. I’m pretty sure it’ll cure what ails you. And as an added boon, the strained elderberries can be added to a variety of recipes to be used again. That also means that you can enjoy those snacks with a little cup of cordial on the side. Put the dried elderberries in a clean wine bottle. Add the cinnamon sticks, then the sweetening and brandy. Cap (the cork from the brandy bottle often works well). Place the cordial in a relatively dark place for 1 month. Shake vigorously from time to time to mix the honey and maple syrup with the brandy. After 1 month, strain the cordial into a new bottle. Enjoy! The brandy measure above: does that mean one and one-half cups brandy, or one measure of one half-cup of brandy? Ah, you fixed it. Excellent. I’ll start a batch as soon as I can find a place to lay my hands on some dried elderberries. Wasn’t The Gump drinking elderberry wine in Legend? I forget. I decanted my barrage of cordials the other night, including the peanut butter, which is still a disturbing light brown, opaque liquid. Smells ok. And the remaining choclate and peanut butter sediment got used to make…BOOZE COOKIES! I should reactivate my Facebook and send you a post about the batch of Swamp Water we made. 10% ABV, green, chunky, and viscous! I found some in this hippie-chick magic-crystal shop in Olympia. Decanted and sampled my batch tonight. By Grabthar’s Hammer and the Suns of Warfan, this stuff is awesome! I had to stop myself guzzling it! Double size batch gets bottled tomorrow. Is the water supposed to be mixed in with all the other ingredients ? What about the water? Am I supposed to put it with the other ingredients?Is it for cleaning the bottle? Do I have to use it to dilute the cordial when I serve it?